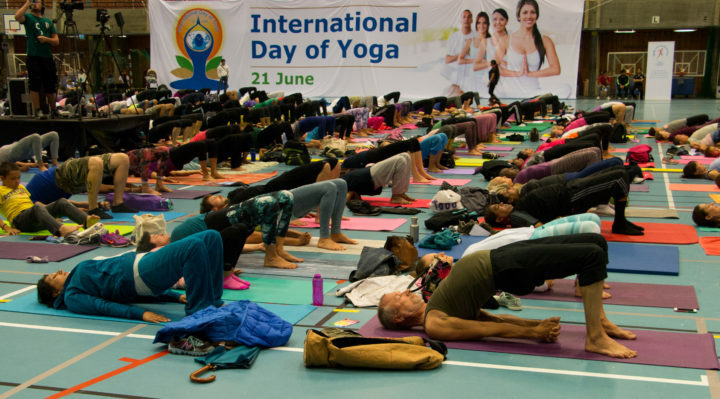 UN has declared 21st June as International Day of Yoga (IDY) in the year 2015. 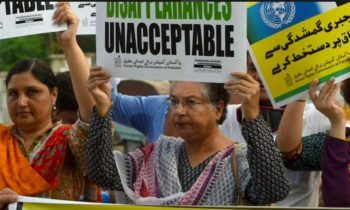 The resolution was moved by India at the UNGA, which was supported by 177 countries including Norway. A letter from Indian Prime Minister thanking Norway’s support to the resolution was handed over to Norway’s Prime Minister in 2015. 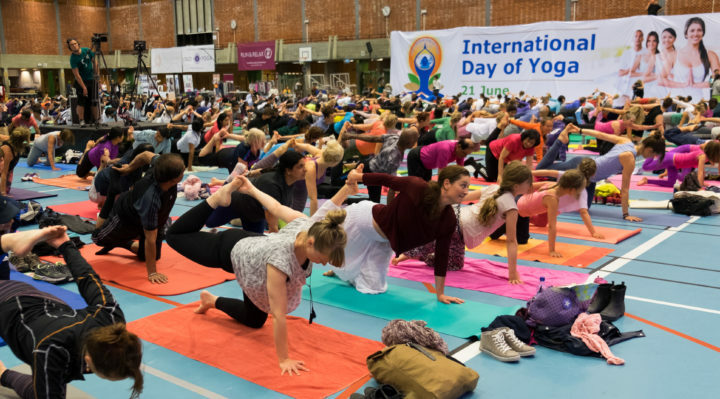 As Yoga was a gift to the World from India, Embassy of India, Oslo organised celebration of the 2nd IDY on 24th June 2016(Friday), at Norwegian School of Sports Sciences, NIH, Sognsveien 220, Oslo from 1600-1900 hrs. A demo on simple postures of Yoga was taught by experienced Yoga teachers. 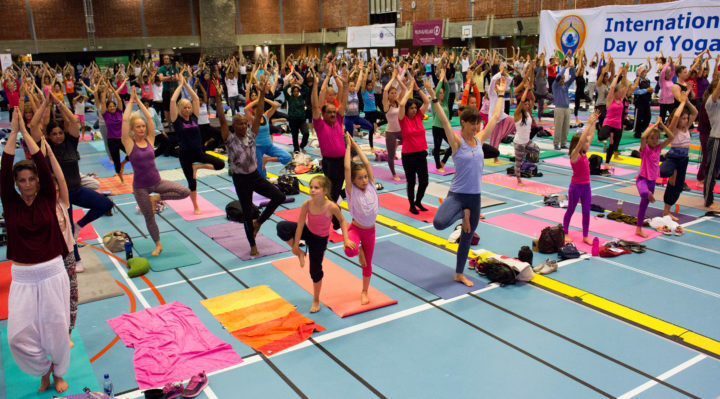 About 600 participants, from both Indian and Norwegian background, performed Yoga simultaneously on the artificial synthetic surface inside Norwegian School of Sports Sciences. Apart from Norwegians/PIOs/NRIs, a few other nationalities also participated in the event. A renowned Ashtanga Yoga expert from Mysore, Mrs. Saraswathi Jois is currently on a visit to Norway at the invitation of “Puro Yoga”, a yoga school in Oslo. Mrs. Jois participated in IDY-16, who was honoured by Ambassador during IDY-16. Two Norwegian Yoga teachers from Oslo Yoga School and Fri Yoga School led the Yoga performance with two other Yoga practitioners on stage, which was followed by participants. The Yoga teachers also explained about the benefits of Yoga in everyday life. 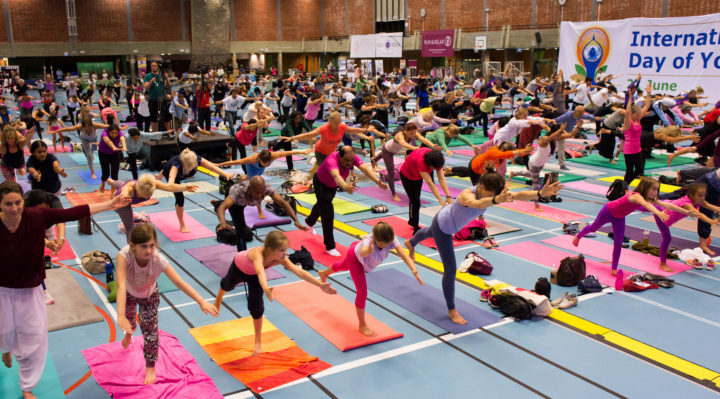 About 25 Yoga schools from Oslo have also put up their stalls in Norwegian School of Sports Sciences on the day to promote Yoga. Entry was free for all the participants. Norway’s Minister for Health and Culture have sent Greetings on the occasion of IDY-16. Apart from Yoga, a short film on Yoga, Flute and Tabla recital and Kathak dance of 5 minutes duration each were also performed. It gives me great pleasure to address you as we prepare for the 2nd International Day of Yoga – this unique occasion that brings all of us together to celebrate the invaluable gift of India’s ancient tradition. 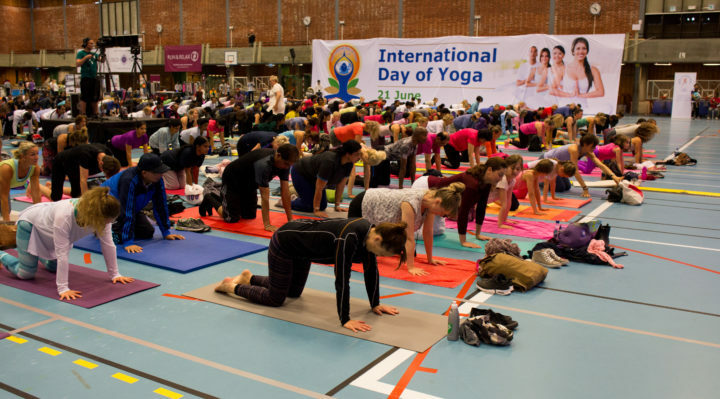 When I outlined a vision foran International Day of Yoga in September 2014 at the United Nations General Assembly, even I did not anticipate the enormous enthusiasm for the occasion from all corners of the world. Your support and participation last year, and once again now redeems our commitment to nurture and promote this ancient discipline, and reaffirms yoga as an exemplary manifestation of “VasudhaivaKutumbakam” – The world as one family. I recall the iconic images from that momentous day last year. 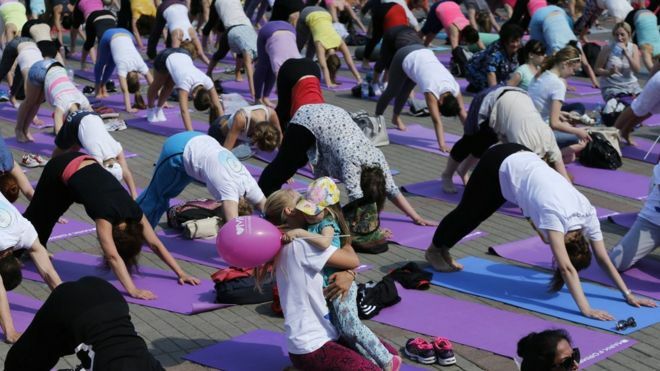 All the way from the Pacific Islands to Port of Spain, from Vladivostok to Vancouver and from Copenhagen to Cape Town, thousands gathered to unite the bodies and minds through the practice of Yoga. And the reverberations of their discipline found a natural home at the UN Headquarters in New York, where the journey had begun. I myself was fortunate to celebrate the event along with 36,000 of my fellow citizens and foreign guests in New Delhi. As so many of you have already discovered, Yoga is much more than a physical exercise – it enables us to access a new dimension of the self, even while providing a holistic approach to preventive healthcare and wellbeing. Yoga helps us to restore our balance and furnishes us with a much needed sense of clarity. And through its unifying power, we seek completeness, and at the same time, a oneness with the world. Today all of you are the Ambassadors of Yoga, taking forward India’s ancient message to the world. I thank you for your commitment and welcome you as sisters and brothers of India’s family. It is a matter of immense happinessthat at India’s initiative the United Nations declared 21 June as the International Day of Yoga. This is the second year when we celebrate the International Day of Yoga with great fervor both in India and abroad. Last year also this event was celebrated on a grand scale and it is our expectation that this time the celebrations will be on twice the scale and will see twice the participation. I would like to emphasize that Yoga is not mere exercise. Yoga is a combination of exercise for the body as well as the soul. For this reason, while a person feels exhausted after exercising, after Yoga the person is not exhausted, rather feels a sense of inner peace. If you start Yoga by doing Pranayam and end it with YogNidra or Shavasan you will achieve release from stress and you will feel new energy and vitality flow through your body. On the one hand Yoga is a medium to fight chronic ailments, on the other it is also a means to attain spiritual energy. Given the grand scale at which we are celebrating the International Day of Yoga, I invite each and every one of you to join hands with us. I would also like to convey my best wishes to those who are unable to participate this time but who would be inspired by you to take up Yoga afresh and participate next time. All our Missions and Posts abroad have made intense preparations to celebrate the International Day of Yoga. 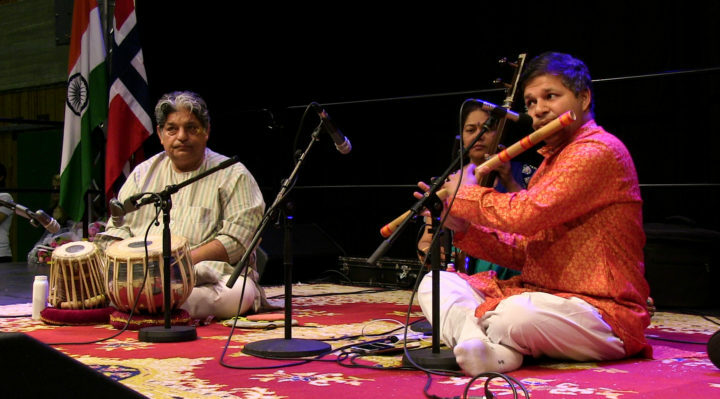 Extensive arrangements have also been made to celebrate this event in India. My warmest wishes to all of you for the success of the 2nd International Day of Yoga. More than 191 countries are taking part in the celebration, including the UK Argentina , Australia and Norway. Indian Prime Minister Narendra Modi called yoga a “people’s mass movement” as he took to the mat Tuesday along with millions of others worldwide to celebrate the ancient practice. 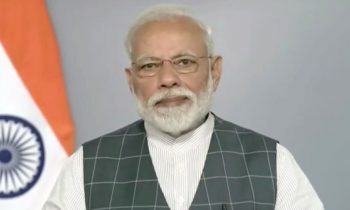 “Do not wait, make yoga a part of your life,” Modi urged in a brief speech to mark the event, an idea he successfully asked the United Nations to adopt. 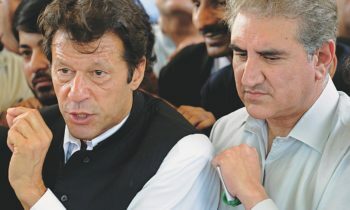 “This is a day linked with good health and now it has become a people’s mass movement,” the 65-year-old premier said. Modi took a short break to inspect the poses of his fellow yogis, who included students and soldiers, before returning to his spot. 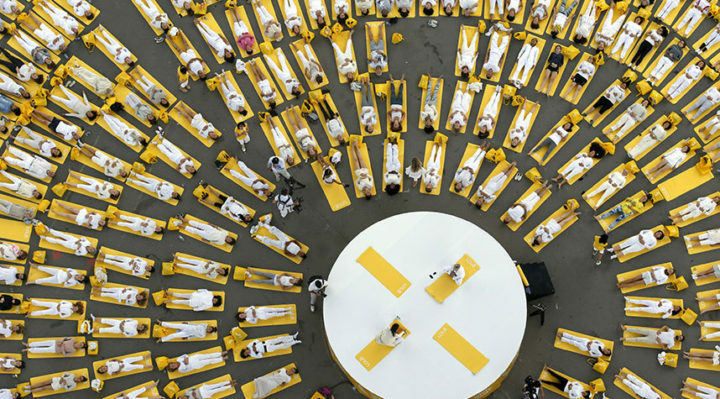 Modi, who credits yoga for his ability to work long hours on little sleep, has been spearheading an initiative to reclaim the practice as an historic part of Indian culture after his Hindu nationalist government came to power in 2014. Yoga is an ancient Indian meditation and exercise philosophy that has existed for centuries. Yogic poses are mentioned in the ancient Indian epic “The Mahabharata”. Considering that the Mahabharata was written in about the 4-5 century BC, this exercise and meditation regimen has a very ancient past. Yoga has two aspects namely the spiritual and the physical. In the end, both synthesize and help the body get rejuvenated. 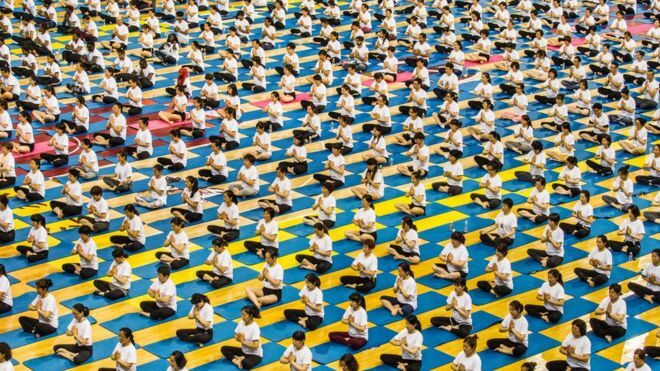 After the arrival of Narendra Modi as the prime minister, the Indian government decided to publicize this exercise and meditation philosophy to the entire world. 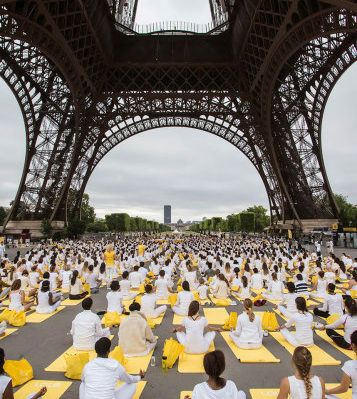 The UN was enthusiastic and declared 21 June as World Yoga Day. Yoga has become extremely popular in the 21st century. Credit must go to many yogis who spread the message of yoga in the Asia, Africa Europe including in Norway. Yoga is a huge part of Norwegian lifestyle, Yoga is now accepted all over the world. 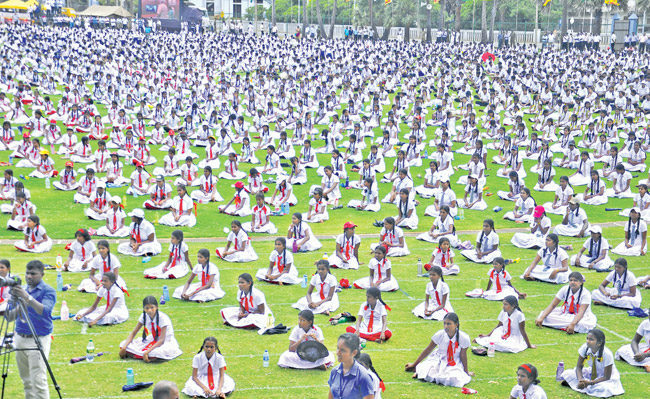 Among foreigners Norwegians also the most consistent followers of Yoga and many practice meditation techniques as taught in this science. 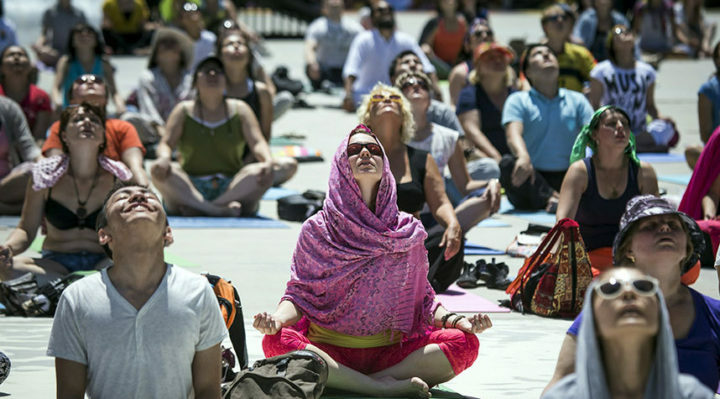 Advanced yogic poses and techniques are supposed to elevate the spirit of the human being to another realm, though no scientific research has been done on this. Yoga is extremely beneficial to women and helps in easier childbirth as well as regaining the elasticity of the body. 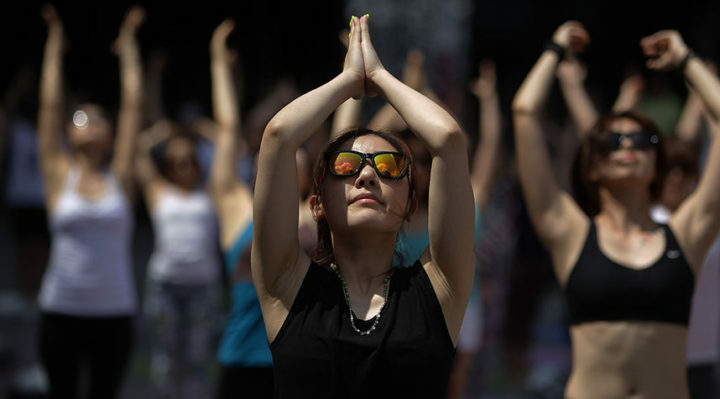 In India yoga day was celebrated with great fanfare and the Prime Minister Narendra Modi led a session at Chandigarh. Stop traffic! 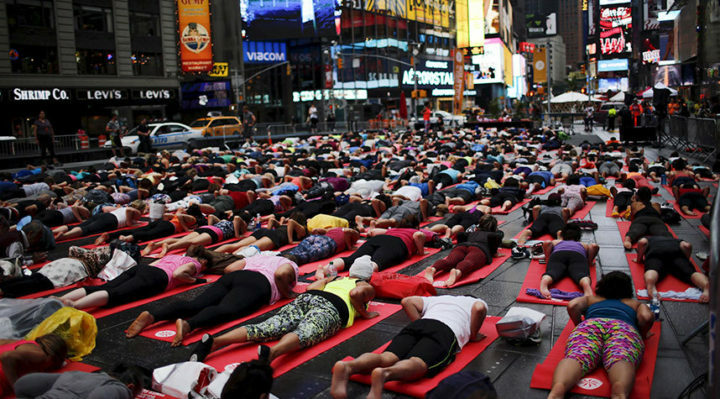 Times Square in New York City, USA, comes to a standstill for a yoga session on summer solstice on Monday. 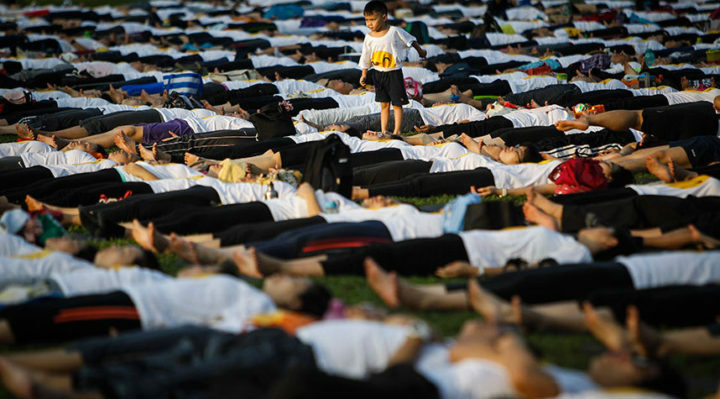 You can almost feel the quiet and calm in this photo of everybody practising their yoga breathing in Zhenjiang, China. What a view! 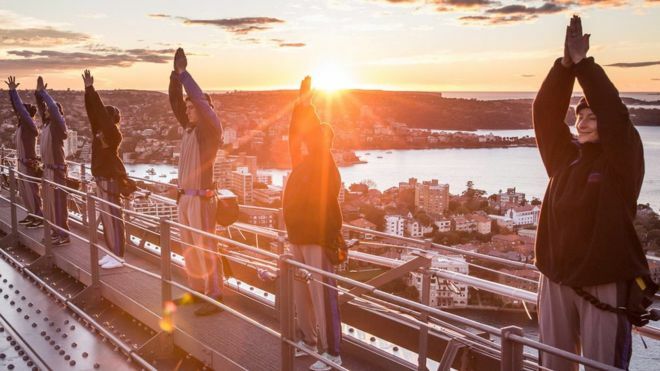 These guys do a bit of yoga at sunrise on top of the Sydney Harbour Bridge! 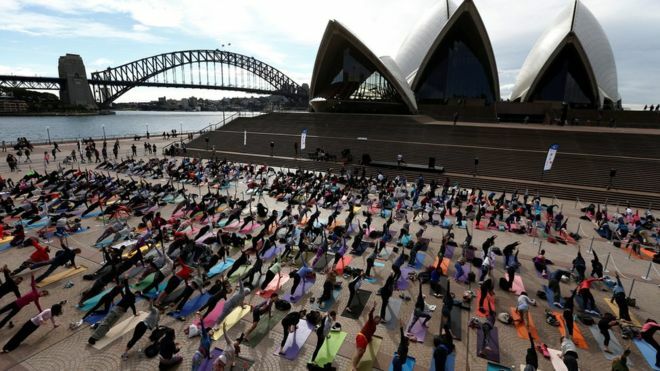 Yoga fans in Australia bend and flex in front of the world famous Sydney Harbour Bridge and Sydney Opera House. 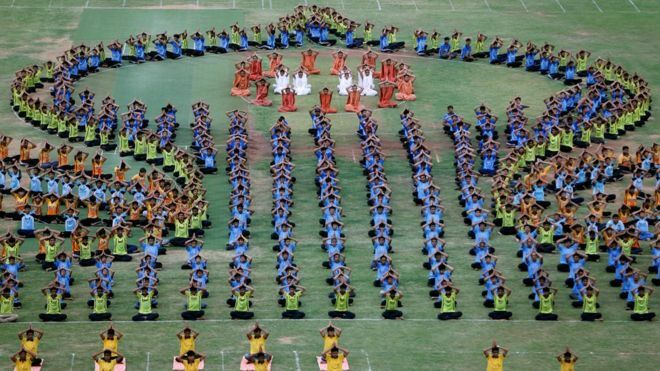 A group of yoga students form a beautiful and colourful shape in Ahmedabad, India, for International Yoga Day on Tuesday. 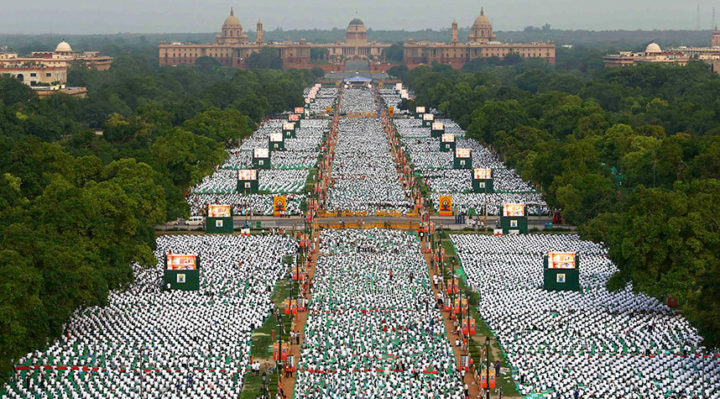 Thousands of participants perform yoga on Rajpath in New Delhi. Prime Minister Narendra Modi hailed the first International Yoga Day as a ‘new era of peace’, moments before he surprised thousands in New Delhi by taking to a mat himself to celebrate the ancient Indian practice.